There are 2 main types of travelers: those that take the bare minimum and can pack for 4 months in one backpack, and those that panic, take 6 outfits for every day and 12 pairs of shoes even thought they’re only leaving for 3 days. I like to think I’m somewhere in between, but it’s taken me quite awhile to get there. In the last couple years of traveling, though, I’ve realized that I often don’t wear the majority of the clothes I pack and fancy shoes just don’t fit into my idea of comfortable traveling. After many trips, I’ve picked up a few tips along the way to make traveling easier on my shoulders (bags get heavy!) and a bit more organized (not usually the name of my game!). 1) Pack a clean pillowcase! I can gross myself out if I think too hard about hotel pillows, but at least my own pillowcase helps me feel better. It also comes in handy if you’re camping, need a headrest on the plane or in an airport during a long lay-over. Shove a sweatshirt or other clothes in your pillowcase and you’re set. At the end of my trip, I pack my dirty clothes in the pillowcase and throw it back in my bag. Once I arrive home, I dump the whole thing in the washing machine and appreciate how it was all corralled in one spot! 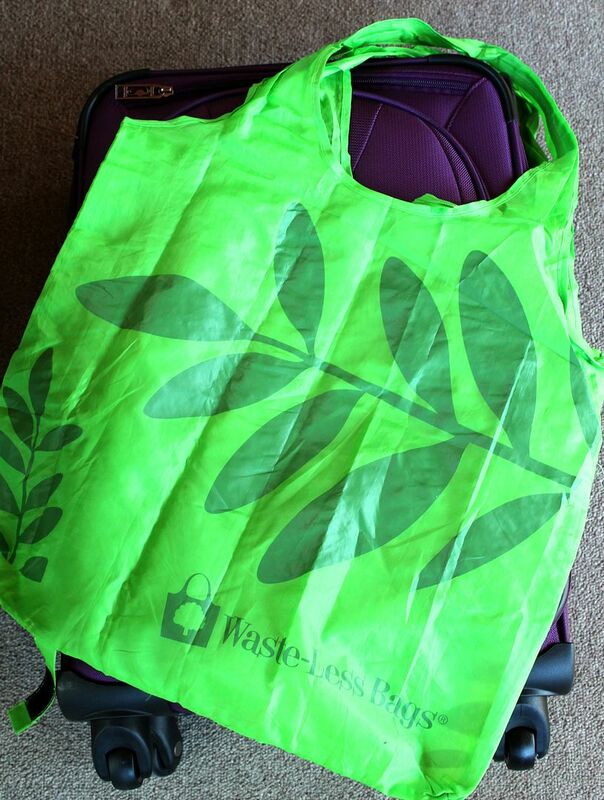 2) I loooove this little roll-up tote bag more than I probably should. It takes up barely any room in your luggage, but can hold a ton once you arrive at your destination. I’ve taken it to farmer’s markets, to the beach to collect shells and so much more! Look at it! It’s no bigger than the width of one rolled-up shirt! 3) My headshot can be found in dictionaries beside the word “frugal”. One thing I struggle paying for is water. I always take my water bottle with me. I like to pack things in it that might break (like my sunglasses!) or a rolled-up blouse that might wrinkle. You can also leave it empty and once you’re through security, fill it with water for your plane ride. I use it daily while we’re on vacation! 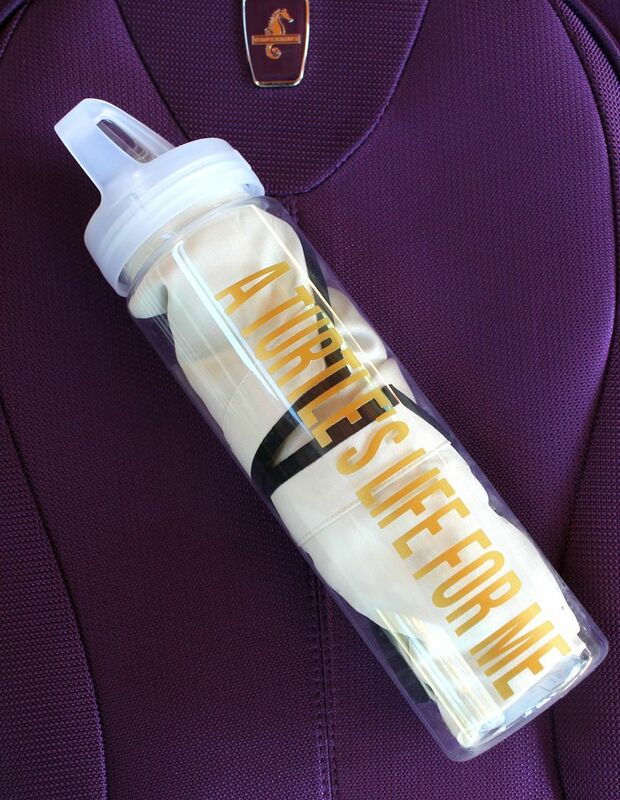 If you’re traveling to a different country, you can also purchase a water bottle with a built-in filter. 4) These small ziploc baggies are what extra buttons are packaged in when you buy a new piece of clothing. I save them and pack individual necklaces in them so they aren’t all tangled when you arrive. Works like a charm! 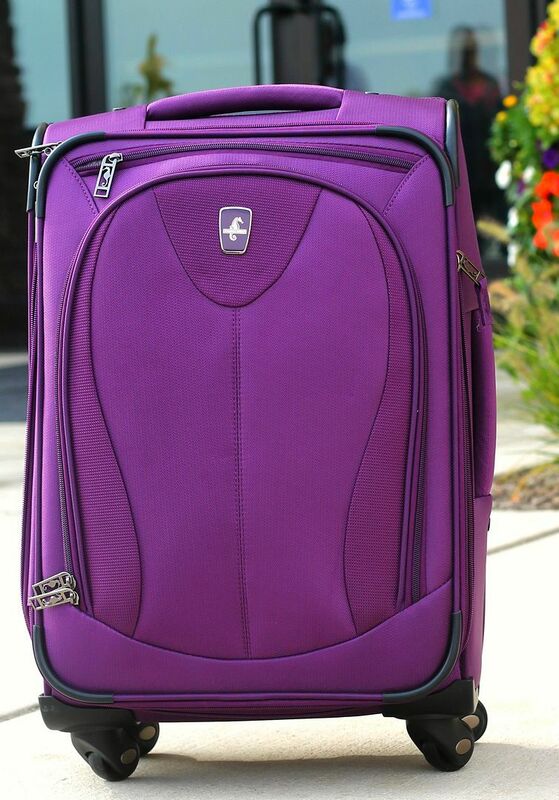 5) Put heavier items in the bottom of your suitcase towards the wheels. This way when you stand your suitcase up, the heavy items are at the bottom and lightweight things that might wrinkle are at the top by your handlebars. Some of the heavy things I pack at the bottom of the suitcase are my toiletries, jeans, sweatshirts, etc. 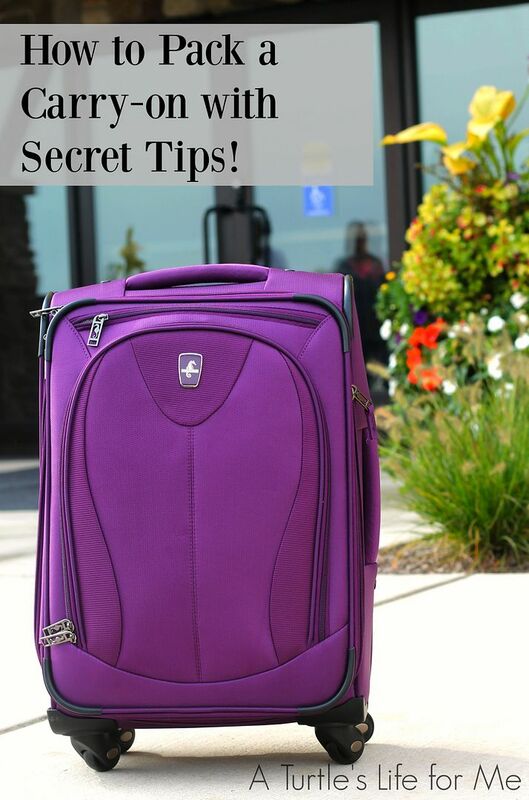 6) Use a carry-on bag that helps you. Yes, there are a difference between bags even if they all look the same with a handle on one end and wheels on the other. I spent many years with a very basic bag before investing in one with 360 spinning wheels. It makes such a difference to be able to wheel it flat in tight spaces (security lines and aisles of a plane, anyone? ), but more importantly, it makes a difference in how my shoulders feel for the first few days of a vacation! They also just last longer! I’m no longer dragging the edges of my suitcase on the sidewalk because I’m tipping it too far. Now the wheels are the only thing touching the ground! 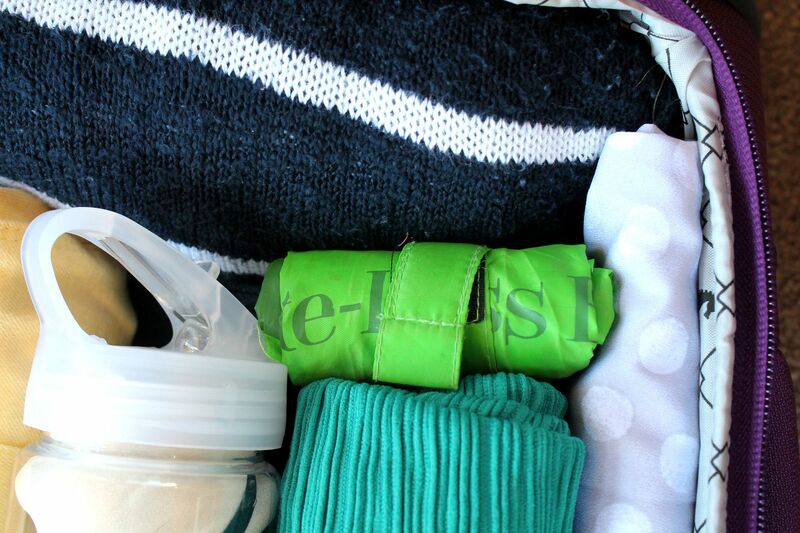 What are some of your favorite travel tips to stay organized while making the most of the space in your carry-on bag? These are fantastic tips (especially since I’m going to be packing soon!)! I am the queen of packing 10,000 Ziploc baggies, but I never thought to put breakables into my empty water bottle! Great idea! Perfect timing! Really great tips (why didn’t I think of these?) and a great offer on Amazon. I needed a new suitcase for my Thanksgiving trip. Thank you for this post. Why didn’t I think of #2! Genious. I have one like that and two that wad up into themselves and cinch up. I use hotel dry cleaning bags for dirty clothes. 12 pairs of shoes… yep that used to be me! Great tips – love them all especially the jewelry storage idea! I’ll use this one next week on my way to NC! These are all such great tips!! Will remember these for the next time I travel! These tips are genius. The pillowcase idea is perfect, and now I can put those extra button baggies to good use. Awesome ideas! Thanks! 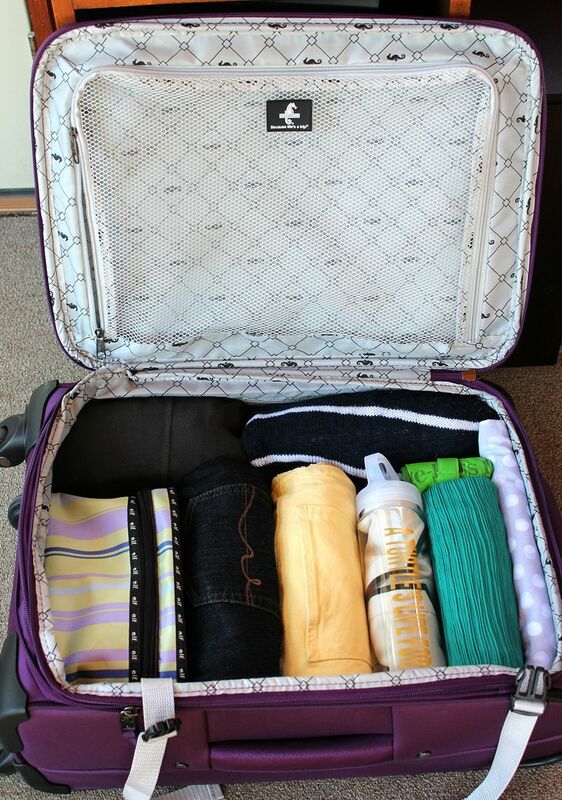 I pride myself on being able to squeeze 6 outfits into on carryon! Now, shoes…that’s a WHOLE other problem, LOL. Great stuff. I love the jewelry solution, I have to try it. Love all of your tips! I’ll use them in spring when I head to the NW.